There has been growing concern regarding particulate matter (PM) pollution and its affects on health. For effective preventative measures, source appointment of PM is extremely important. Therefore, indication of PM elemental concentration is also necessary in addition to PM mass concentration. 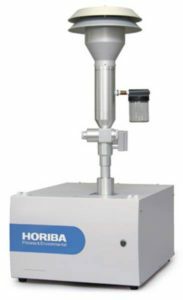 PX-375 enables automatic sampling, continuous online PM quantitative and qualitative analysis and rapid air pollution source appointment. Continuous analysis of PM mass and the elemental concentration by a single unit directly in the field. Adoption of world proven technologies: X-ray fluorescence & Beta-ray attenuation. Installed CMOS camera enables observation of collected particulate sample on the filter. *Please consult about communication and instrument composition separately. See Table 2 “Detectable Elements”. Standard parameter is S, Ti, Cr, Mn, Ni, Cu, Zn, Pb, Al, Si, K, Ca, V, Fe, As.